A Mandragora that has a growing cluster of infected mushrooms. 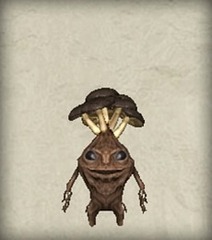 As the black mushrooms blends in the dark, this particular Mandragora has a high ratio of going missing. Recently the issue of straying Mandragora has become a concern, and research indicates that 40 percent of those strays are of this particular subspecies.